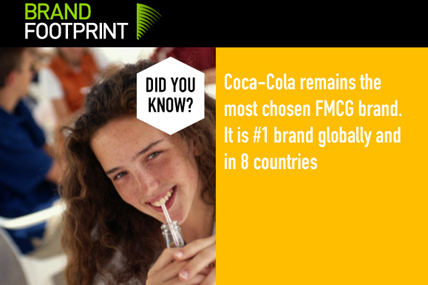 Brand Footprint reveals the most chosen and fastest-growing FMCG brands across the world. 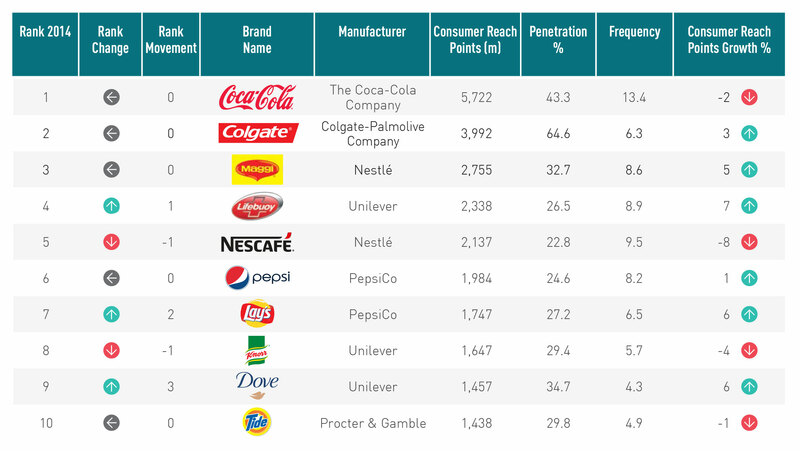 Colgate is the only brand bought by over half of the world’s households, according to Kantar Worldpanel’s Brand Footprint report, an annual study of the 50 Most Chosen Global FMCG Brands. Brand Footprint is set apart from other brand rankings by providing information on real consumer behaviour rather than attitude. Consumer Reach Points (CRPs) form the basis of the ranking. An innovative metric that measures how many households around the world are buying a brand (penetration) and how often (frequency), it provides a true representation of shopper choice. Gaining 19 million new shoppers in 2014, penetration was at the heart of Colgate’s success, showing positive growth in every region across the world. Indian shoppers contribute to at least half of its new buyers, with the brand entering 86% of households in the country. Colgate reigns as the most chosen health and beauty brand by consumers worldwide, growing its CRPs by 3%. P&G’s fabric softener brand Downy is the ranking’s top riser for the second year running, growing its CRPs by 23% pushing it four places higher to number 14. 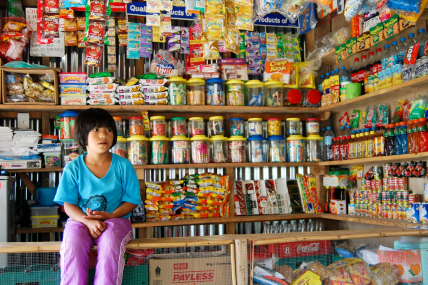 It joins Vim, Sunsilk, Doritos and Yakult, in the world’s Top 5 fastest growing brands by CRP. Dove made its first entry into the Top 10 at number nine, adding 14 million new shoppers to its worldwide consumer base and growing its CRPs by 6%. Brands to watch include Dettol, Oral-B and Pringles, all growing fast and knocking on the door of the Top 50, increasing their CRPs by 11%, 9% and 7% respectively. Dettol rose five positions in the global ranking to 57th most chosen brand, while Oral-B and Pringles made their debut in the Top 70 at 67th and 68th place respectively. 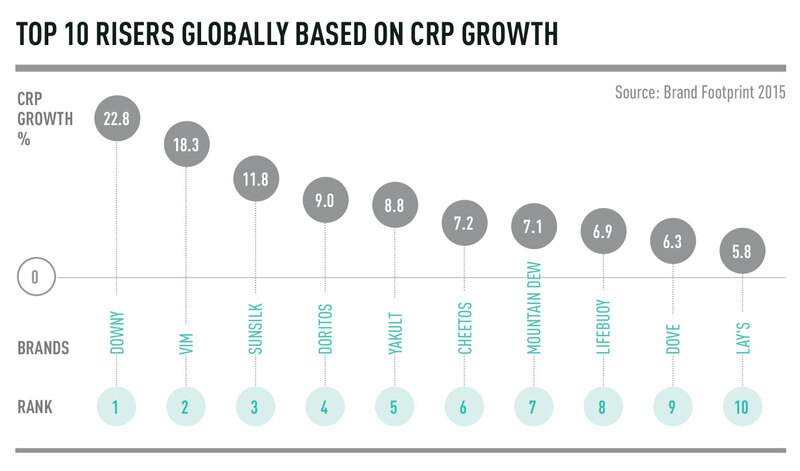 This year’s Global Ranking reveals that half of the 11,000 brands analysed are growing their CRPs. Of these, 75% can attribute their success to growing their shopper base (increasing penetration). This is the one defining characteristic among all growing FMCG brands. While all of the Top 10 brands achieve over 20% penetration, two thirds of all FMCG brands are below this figure. With Colgate being the only brand bought by more than half of global households, this means every brand has plenty of headroom for growth. Each growing brand is demonstrating a healthy appetite to explore new markets and adapt their brands to meet the needs of local cultures. Those with a social or community function have performed well, none more so than Dove, whose crusading campaign for real beauty is connecting with consumers emotionally and encouraging purchase across the world. “Brand Footprint is the most comprehensive study on FMCG brands across the globe, providing key findings for driving growth and success. “This year, we reveal that growing FMCG brands follow one simple rule, growth is about penetration: retaining and increasing the number of shoppers choosing the brand. Chinese brand Master Kong hold No.1 for three years as China's most chosen FMCG brand.Mizone is the ranking's top riser.